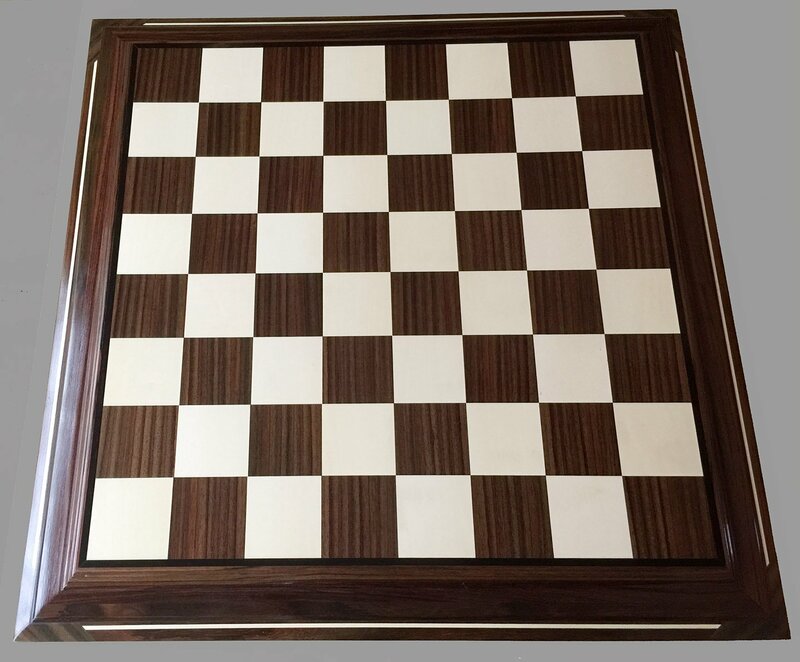 A Holly and Brazilian Rosewood Chessboard with 2-1/2” squares in Brazilian Rosewood and Holly, with a Brazilian Rosewood Frame, 25-1/2” Square, designed by Frank Camaratta and Crafted by Bill Lisica. 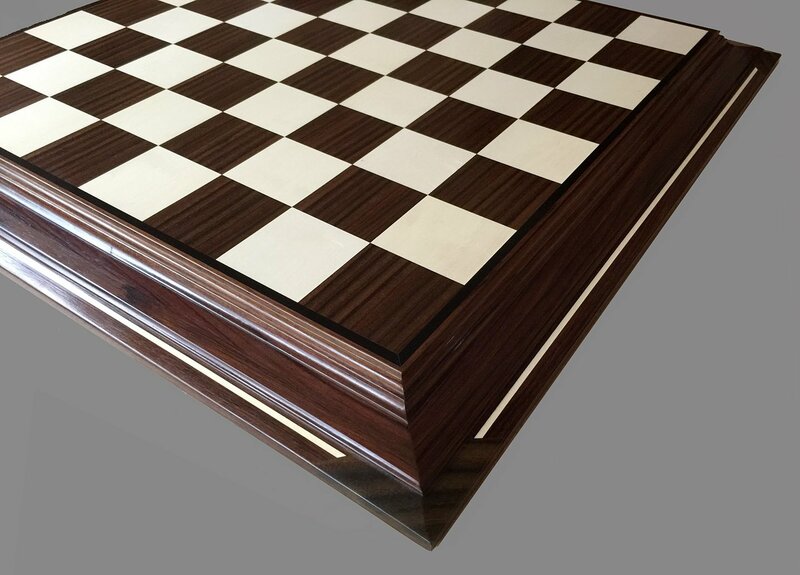 Brazilian Rosewood, is also known as Bahia Rosewood and Jacaranda, its Scientific name is Dalbergia nigra. It can vary in color from a darker chocolate brown to a lighter purplish or reddish brown, with darker contrasting streaks. The black streaks can sometimes form a unique grain pattern that is sometimes referred to as “spider-webbing” or “landscape,” very similar to Zircote. The Lighter yellowish sapwood is clearly demarcated from the heartwood. Brazilian Rosewood is very expensive. Its trade is highly regulated, and sales are generally limited to reclaimed or pre-existing pieces of lumber. Like other exploited hardwoods such as Cuban Magogany and Teak, it has earned worldwide fame. Historically, it has perhaps been the species most frequently associated with the term “Rosewood,” and with its strength, hardness, stability, beauty, and acoustic properties, it’s easy to see why Dalbergia nigra has been used for everything from flooring to xylophone keys. Due to the high demand and its continued exploitation in recent decades, it has been listed in the most restrictive category of endangered species: CITES Appendix I. Not only is the lumber restricted from being imported or exported from country to country, but even finished products made of Brazilian Rosewood may not cross international boundaries. Because of these heavy restrictions, several substitutes from the Dalbergia genus have been used in recent years, such as East Indian Rosewood, Honduran Rosewood and Cocobolo; though perhaps the closest rosewood in terms of color and appearance may be Amazon Rosewood (Dalbergia spruceana) – another hard-to-find and very expensive rosewood, though not CITES listed.